April, time of the first fruits and time of news at La Notizia where they never stop trying new combinations of flavors, textures, colors and aromas. This time the protagonist is the zucchini. Whether raw or grilled, baked or fried, loved for its ability to fit to the inspiration and desire of the chef, the Cucurbita pepo, its scientific name, from appetizer to dessert indulges without feeling guilty. Lot of water and only a handful of calories, vitamins and minerals galore, make it the perfect candidate for the warmer weather recipes. And if the type of cut makes all the difference, from the classic rounds to the more fanciful julienne, it has to be said that it satisfies all tastes. With potatoes, tomatoes, eggplants as its companions on the journey to the old country, our kitchen green friend, with a flower on the head, changes its characteristics from north to south along the Italian boot and amazes even the most demanding palates with a five star result. As striking is the result of the union with the mixture of flour, water, salt and yeast. 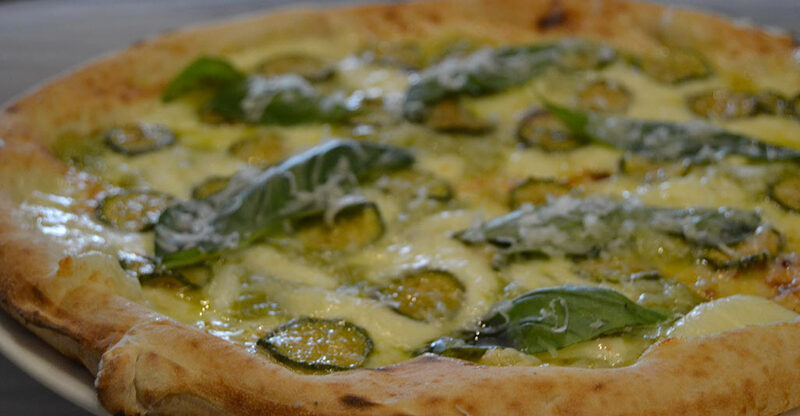 Pizza Nerano: this is the name of the new arrival in its two versions. With or without smoked bacon, the zucchini, some fried, some creamy, go with fior di latte, grated provolone del Monaco cheese to smell the mint scent. That the master has the coast in his heart is now well-known. Wearing Francesco Caravita prince of Sirignano, famous as Pupetto, clothes, Enzo Coccia wanted to redraw the boundaries of a recipe that in Nerano was born in 1952. For a joke or a provocation, the extravagant star of Capri Island life, which inspired to Totò the famous walk, invented a dish that rules still today.